It was a fortuitous day that I was sent a flyer by Sydney Aquarium on a talk by Earthwatch Institute. Although Earthwatch does not cater exclusively to underwater dive volunteering, it brought volunteers to its conservation and research causes and its few dive-related research expeditions stood out: whalesharks and manta rays. Yes, the holy grail of diving, or, let's talk the talk, "charismatic megafauna". IE., big critters we love to love. Earthwatch do a fantastic job converging science, funding and engaging the general public. The institute is worldwide and almost 40 years from its inception in the US. Project Manta offers volunteers an opportunity to work with marine biologists pursuing genuine research goals. It is also great fun, and working together as a team provides an environment for bonding friendships. Lest you think this is dumbed-down science, it is not. While this article is targeted at the lay recreational diver and written by a non-scientist, Project Manta has three PhD/PhD candidates who have been or will be writing scientific papers on their research. Project Manta has recently obtained another cycle of funding from the Australian Research Council, which is proof in the pudding of its integrity in research methodology and outcomes. 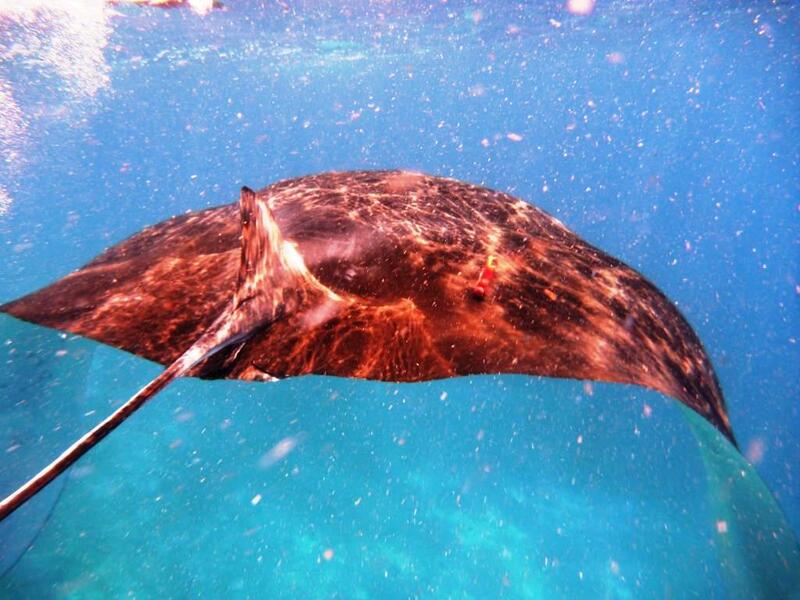 Manta rays aggregate worldwide in a couple of well-known spots. Amongst them, there is a feeding frenzy at Hanifaru Bay, Maldives, that has to be seen to be believed. Mexico is known for its giant manta rays, Manta Birostris, and Yap is well known for its manta aggregations. In eastern Australia, manta rays cluster around a remote coral cay island off Queensland called Lady Elliot, visit North Stradbroke Island off Brisbane and have been seen as far south as Byron Bay, New South Wales. Where do mantas go? When? What attracts them to a spot – feeding, cleaning stations or mating? How many visit known aggregation spots constantly, how far do they travel? Are they a single global population or discrete local populations? Surprisingly little data exists about this. In fact, it was only recently discovered that there are two manta species, the giant Manta Birostris distinct from its smaller cousin, Manta Alfredi. It’s a recent discovery, only because one scientist had the good fortune to see the two species together off Mozambique and think, hey, there’s definitely a difference there. There are scientists around the world tracking mantas in their local waters. They talk to each other and compare notes. The Project Manta scientists are tracking mantas off the eastern Australia coast, using Lady Elliot Island and North Stradbroke Island as research bases. We now know a little more about the mantas’ migratory habits along the eastern coast of Australia because of the photo ID database compiled by the Project Manta team, augmented by data from acoustic and satellite tagging. But we are still finding out why they visit this area. Hence, theextensive data collation on manta movements, plankton density, water temperature, tides, currents and other oceanic conditions, so that hopefully, correlations and conclusions can emerge fromthe data. 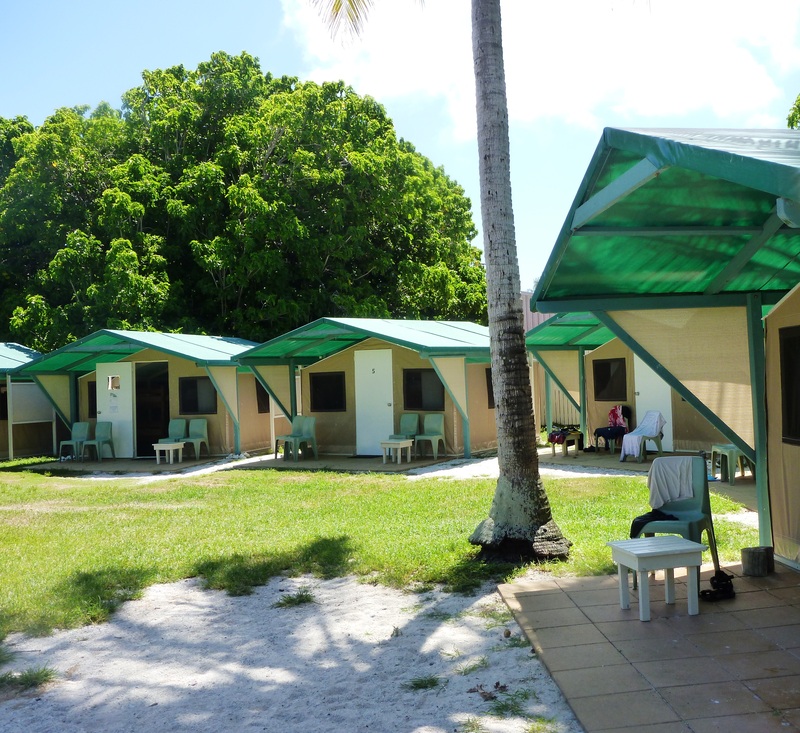 Earthwatch organises one-week expeditions where volunteers can accompany and help the Project Manta scientists on their field trips to Lady Elliot Island. For more information, see Project Manta expedition details. Project Manta is led by Dr Kathy Townsend of University of Queensland, based inBrisbane, Australia. She is also head of UQ's Moreton Bay Research Station on North Stradbroke Island. Kathy also has another ongoing project with Earthwatch conducting research into turtles,and the rubbish they ingest. On Project Manta, she is both the instigator of the research and instrumental in bringing funding through collaborators like Earthwatch and more traditional grantfunding sources like the Australian Research Council. 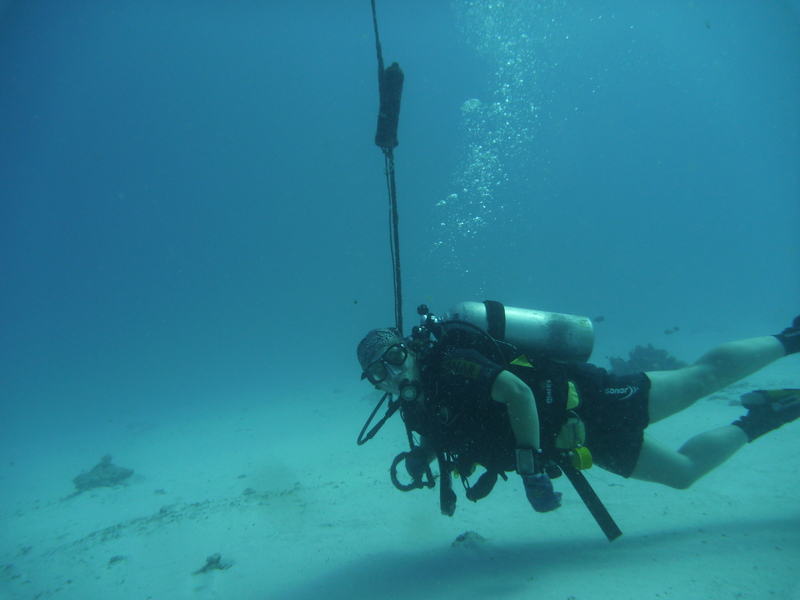 Here's Kathy taking her manta pinger for a stroll underwater. On this trip, we had the bonus of having three documentary makers who filmed Project Manta and gave the team a preview of their doco. Gisela Kauffman directed and produced the doco with Carsten Orlt and cinematographer Malcolm Ludgate. It was nice for me to meet other volunteer "junkies”. Linda is an adventurer from Hawaii and Hideko from New Jersey works in financial news; both have participated in previous Earthwatch expeditions and US/Caribbean fish ID surveys. Kenji is a scientist from Shiseido the cosmetics company and Noriko works in logistics. They work very hard and the one holiday they have a year is devoted to joining a volunteer camp, a humbling thought. Lucy’s an IT specialist enjoying a few gap months. Photo ID database. Each manta ray has a unique pattern of spots on its belly, and this is a typical belly shot below. After we positively ID a manta or determine it's a manta not encountered before, the team whiteboards the findings. The Project Manta scientists have now compiled a database of over 400 individuals sighted at Lady Elliot, North Stradbroke and as far south as Byron Bay. If you, as a diving local along the east coast of Australia, have a belly shot of a manta ray, do send it to the Project Manta scientists. The photo ID diving is what attracts most volunteers, but Project Manta is more than that. 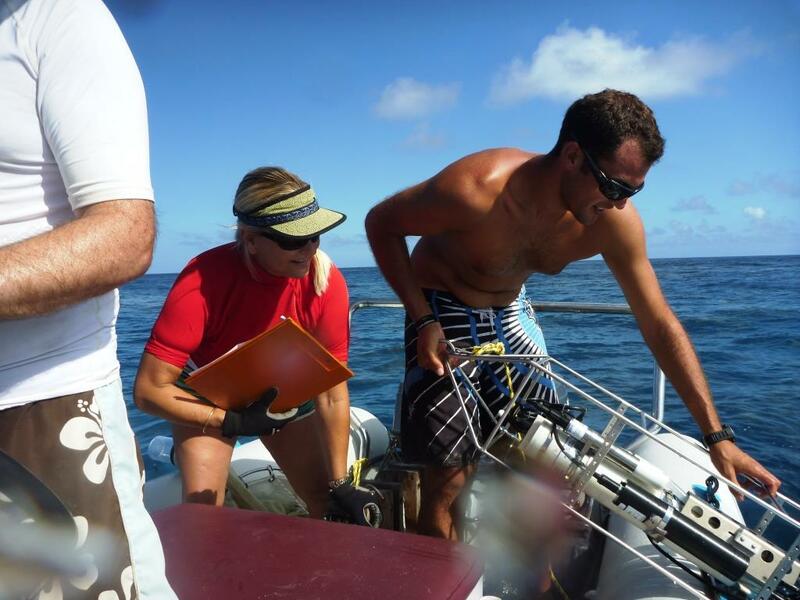 Small scale pinger tracking.Project Manta uses tracking of acoustic tags or “pingers”. Project Manta volunteers are involved in retrieving, downloading data, cleaning/painting with anti-fouling paint and re-installing the ping sensors, which are attached to moorings at fixed sites around Lady Elliot. These are the red devices pictured below. Large scale sat tag tracking. Satellite tags are attached to the manta, which monitor depth, temperature and light levels as the manta moves through the oceans. At a predetermined time, the sensors self-detach from the animal and float up to the surface for transmission. Most tagging is done by free diving. Here is a picture of a tag on a manta's dorsal fin. Plankton collection and analysis. Volunteers are involved in a surface trawl of plankton, bagging samples, conducting agross plankton measure back in the lab and data entry. The plankton samples are then preserved in formaldehyde for more detailed analysis after the field trip. Other data measures: conductivity, temperature, depth, fluorescence (CTDF). Pictured below is a CTDF, which the volunteers lower into the water for a few secondsat various sites. Temperature sensors are attached to the same mooring line as the ping sensors, which is what Kathy is doing here. In addition, the Lady Elliot diveshop helpfully records manta sightings throughout the year and the weather, tides and other oceanic conditions to help build up the correlative data. The research behind Project Manta extends beyond what the volunteers help out in. Biopsy sampling in labs, plankton analysis and oceanographic science all come into play, supported by scientists specialising in the field. Kathy is overall supervisor of activities, drawing up the volunteer schedule. She would first retrieve the acoustic and temperature sensors from the various underwater mooring sites, download the data into her computer back at base, and then re-install the sensors underwater. After this is done, Kathy would join the team on manta identification, which is to search out mantas at their favourite aggregation sites and take belly shoots. Volunteer time is also spent on a small boat collecting plankton samples and looking for manta feeding trains. Volunteers are split into three teams to support different tasks. The scheduling is done so that each volunteer has an equal share of diving, plankton and lab/data entry work. The volunteers live in ecotents. Actually, paying guests at the eco-resort also live in ecotents. They are clean, comfy but a serious lack of cupboard space means that every available inch of bed bunk and outdoor chair becomes an impromptu washing line. Of course, there is the après dive of sunset sangrias, communal dining, fun snorkels, silly games and other moments that make up a fabulous week.